I had a visit a while back from a New York writer, Eric Marcus, and we went for a bike ride. Eric lives in Chelsea, in New York, and has become a bicycle advocate in that cool neighbourhood. Nevermind the fact that he doesn't own a bike or that the bike he rode when we met up on City Hall Square was borrowed from a Danish friend and was the first one he had ridden in 20 years. He just thinks that bike lanes in his 'hood and in New York City are a brilliant idea. He is pleased with the new bike lanes on 9th Ave in NYC. When the local community board, among others, started complaining about plans for a bike lane on 8th Ave, Eric didn't quite get it. 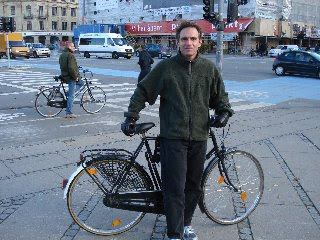 On this trip to Copenhagen he decided to research 'bike culture'. Besides meeting up with me, he interviewed Jan Gehl, the legendary urban planner and architect. 8th Ave is known as the Gay Boulevard and I was suprised, and amused, to hear that local protests included calling the Mayor of New York 'anti-gay' because... get this... 'bike lanes will kill off businesses'. As though it was his master plan. Eric wrote this great article for his local paper Chelsea Now. Have a read about his Copenhagen experiences and his local battle for bike lanes on 8th Ave.
All this talk about Chelsea makes me miss Hotel Chelsea something rotten. It was my favourite hotel in New York for years. Ah, 1998. Back in the day.